On that day it was a not a case of trying out a new veggie in the usual recipe but because of non availability of any other veggie in my fridge. My in-laws were coming from villupuram to my home. It was a bit sudden after a frantic phone call in the morning and I was not prepared. For lunch as usual I planned sambar and had the dals ready only to find out that there was no suitable vegetable except for a lonely capsicum. So I thought why not. 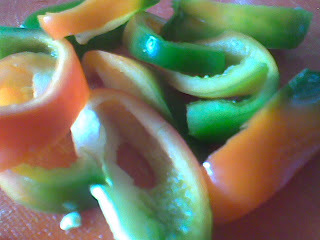 As for my FIL, hubby and children bell peppers are always associated with Chinese cuisine. My elder son, Arun would never touch it. He will go even hungry but would never eat this particular veggie which used to make me mad. What am I to use for fried vegetable rice and noodles other than carrots and mushrooms? I love the flavor it emits even while cutting bell peppers. It is quite unique. So I went ahead and made the sambar. Both of them arrived and sat down for lunch and hubby also came home for lunch. I need not have feared at all as everyone loved the sambar with the unique flavor of capsicum. My MIL especially loved it. For a person who did not know what do with the capsicum she now frequently makes capsicum sambar at home. Pressure the dal with 2 cups of water with the turmeric powder and asafetida for 3 whistle with a few drops of oil to ensure fast cooking. Mash the dal well with a ladel and let it settle. After a while you will see the excess water standing on top and the dal to have settled at the bottom. Soak the tamarind in hot water and extract the pulp. Cut the capsicums lengthwise. In a kadai, heat the oil and put the mustard seeds while they crackle add the cumin seeds, onions, curry leaves and capsicums. Sauté them till the onions brown slightly. Now pour the water on top of the dal and add salt to this mixture. Let it come to a boil and now add the sambar powder and tamarind pulp. Cook it covered for 10 minutes. Serve hot with rice after garnishing with chopped coriander leaves. 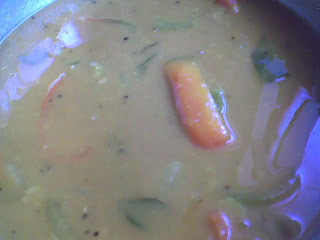 This capsicum sambar goes to pooja for celebration of the event JFI-VOW on completing the 2nd successful year. its raining here outside and seeing this sambhar makes me feel so comfortable :D.
can u please send the pic you wnat to display in round up ?